In an effort to prevent ecological calamity in the Chesapeake, F&M faculty and students usher in a new paradigm for ecosystem restoration. Hanging on the wall of Dorothy Merritts’ office in Franklin & Marshall’s Hackman Physical Science Laboratories are two panoramic photographs of Big Spring Run, a stream valley located just south of Lancaster. The photos are a Christmas present from her scientific partner-in-crime—and, as it happens, her husband—Robert Walter ’75. In one of the panoramas, as Walter describes it, there’s a landscape filled with invasive plants and a high, muddy bank towering above a narrow, shallow stream. The differences in the second photo, taken a few years after the first, “couldn’t be more stark,” according to Walter. Where there was once mud and scraggly plant life, there’s now a verdant wetland. Under the watchful eye of Merritts, Walter, and a collaborative team of environmental engineers, geologists, botanists, landowners and F&M students, Big Spring Run is transforming into a new ecosystem, one that’s helping to revive the Chesapeake Bay Watershed’s ecology and challenging long-held, but ineffective, notions about stream restoration in Pennsylvania. How did they do it? For starters: removing 20,000 tons of legacy sediment—“mud,” confirms Merritts—from the restoration site. At first, removing truckloads of dirt sounds like a drastic solution for fixing a stream valley struggling with erosion and loss of plant life. Prior to her work with Walter, Merritts’ stream-restoration efforts focused on adding elements to the landscape, like tree saplings or boulders, to prevent further erosion, rather than taking away existing soil. And, in the case of the Big Spring Run site, earlier efforts to plant trees along the stream had failed—saplings planted there died within a few growing seasons. If you asked any Pennsylvania native to draw a picture of a river, they’d most likely draw a curved “S.” That’s the shape of the “naturally meandering stream” Merritts mentions, and it turns out that shape—as the professors have demonstrated in their groundbreaking research—isn’t a natural one. It’s the product of hundreds of years of human intervention, which have obscured naturally occurring wetlands under tons of dirt, silt and mud. This revelation threw the scientific community for a loop back in 2008, when the professors published their findings about the effects of human industry on stream valleys in the journal Science. Their discovery challenged every assumption about what river valleys were supposed to look like, and the research they’ve conducted at the Big Spring Run site—putting their theories to the test—is now providing alternative, cost-effective solutions for preventing stream bank erosion and high sediment loads into the Chesapeake Bay. The restoration efforts combine the expertise of a diverse team of scientists from Pennsylvania and as far away as Oregon and California. Managed by the Lancaster Farmland Trust, the project is funded by the Pennsylvania Department of Environmental Protection (DEP), Environmental Protection Agency (EPA), U.S. Geological Survey, National Science Foundation, Pennsylvania Chesapeake Bay Commission and F&M. It has succeeded, in part, because the team was able to identify elements of the historical ecosystem buried deep beneath the 20,000 tons of sediment removed from the site. Jeffrey Hartranft, a botanist by trade, works for the Pennsylvania DEP and is part of the Big Spring Run project team. In the course of partnering with Merritts and Walter, he was excited to discover that lying beneath the legacy sediment of Big Spring Run was a possible key to the environment that had thrived there in the past. “I was looking at this hydric soil saying, ‘Wow, this is a paleo-environment that gives us a clue as to what was here beforehand,’” says Hartranft, who studied the evidence of seeds and other plant life unearthed once the sediment was removed. Figuring out that the site should be restored as a wetland at all is an accomplishment in and of itself. “Conventional wisdom had always held that the landscapes adjacent to streams were forested,” explains Hartranft. 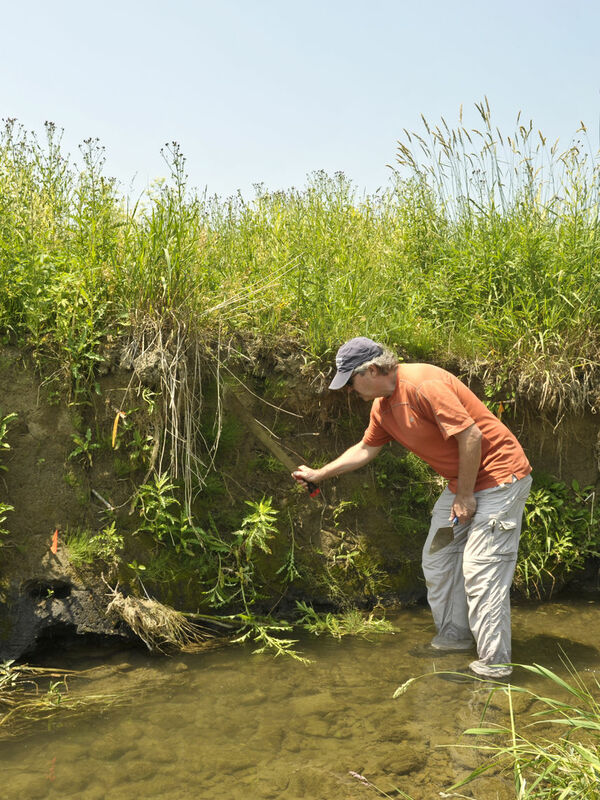 “We found evidence contrary to that.” The team discovered, instead, a complex ecosystem involving many different stream channels and wetland sedge meadows buried beneath hundreds of years worth of muck. “There was a time in American history, not very long ago, when the wetlands were drained to create more farmland,” says Walter. “But now we recognize that wetlands are extremely valuable on the landscape and are often called ‘nature’s kidneys’ for their ability to filter out toxins.” By restoring more areas like Big Spring Run to their original wetland-like conditions, Merritts and Walter hope to prevent sediment from polluting the bay in the first place. 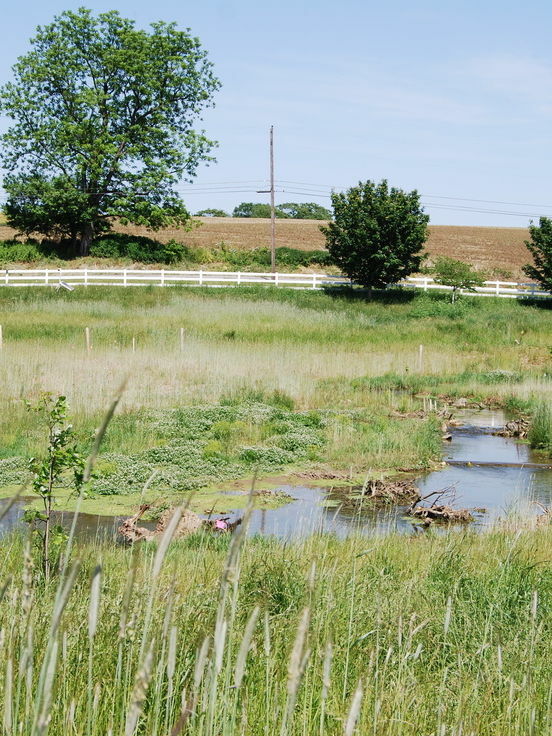 As Hartranft explains, not only has the Big Spring Run Project hit upon a more effective way to restore wetland areas to Pennsylvania, but the project has also identified many other possible wetland areas that could be restored throughout the state in the future. Whether those pieces of evidence are historical maps showing the location of 18th-century mill dams or legacy sediment pointing to hidden wetland ecosystems, it’s this kind of interdisciplinary thinking that makes both Merritts and Walter such successful scientists and teachers. “The kind of environment that we have at a school like Franklin & Marshall, which values teaching and scholarship as much as it does, [allows our research] to percolate much more readily than it would at a large research school,” says Walter. “We’ve produced probably at least two dozen F&M senior theses out of this project, three master’s theses, and one Ph.D. in progress right now,” Walter adds. 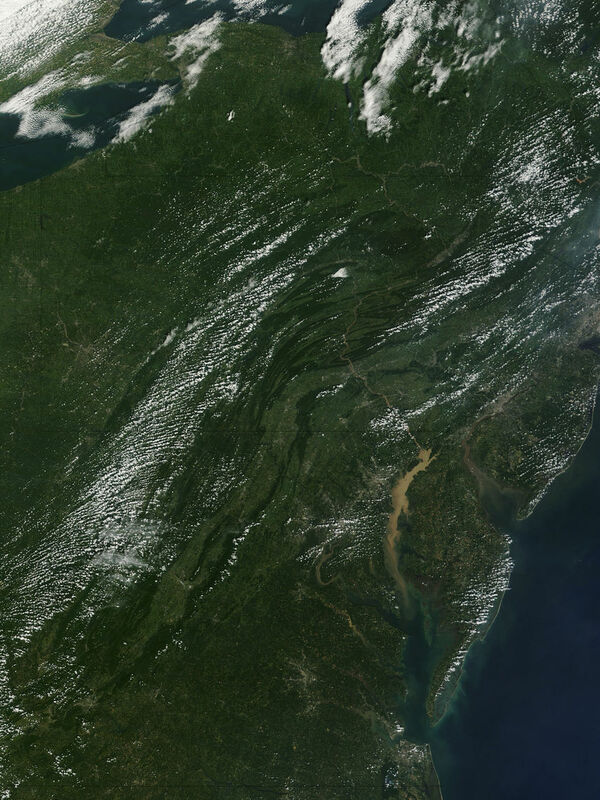 These results spell good news for the improvement of the Chesapeake Bay Watershed and will directly affect other restoration efforts taking place across the country. In addition to their work at Big Spring Run, Merritts and Walter are in contact with scientists at Duke University, the University of North Carolina and the University of Louisville, hoping to impact similar ecological research incubating in the South. Closer to home, a new restoration site at Piney Run, Md., in collaboration with the Maryland Department of Natural Resources, will use the data from the Big Spring Run Project to inform its initial engineering design—a huge leg up in starting on a successful path to stream restoration. As the new ecosystem at Big Spring Run thrives, the area’s future may wind up looking a lot like its past—the verdant wetland in the photograph in Merritts’ office that provides a little window into the site’s 8,000-year-old history.